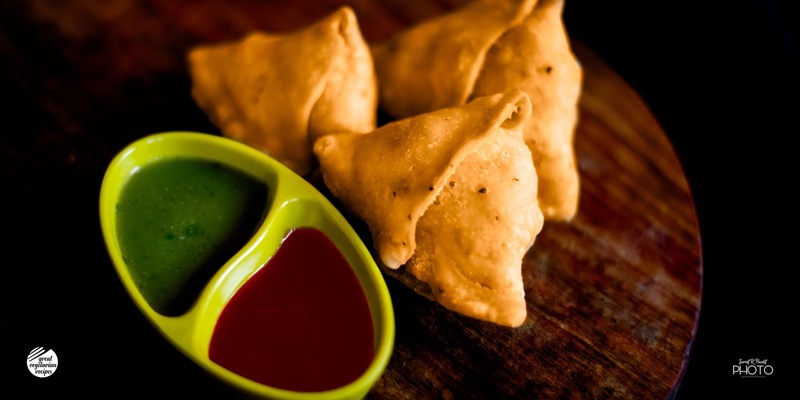 Samosa is a very popular tea time snack in India. Crispy crust and spicy stuffing makes it so irresistible! Learn how to make samosa recipe at home. Here goes the samosa recipe with step by step photos. Most important part of samosa is definitely the stuffing! So, let's start with the yummy stuffing. 2. Meanwhile, dry roast 1 tsp coriander seeds and 1 tsp cumin seeds until it's fragrant. 3. Cool it. Then use a mixer to prepare a coarse powder. Keep it aside. 5. Add 1/2 Tsp cumin seeds, 1/2 Tsp coriander seeds and dried red chilli. 6. Add coarse ginger and green chilli paste. 5. Saute it for about a min, then add mashed boiled potatoes. 6. Add salt, red chilli powder, dry mango powder(Aamchur powder) and the powder that we have prepared in step 3. You can alter the quantity of the spices as per your taste. 7. Mix everything well. Add a little water and mix it well. Let it cook on low flame for about 2-3 minutes. 8. Stuffing is ready! Stuffing should be tasty. If anything is less or more then you can adjust it now. Time to prepare the dough. 1. Mix Maida, ghee, salt and carom seeds(Ajwain). 2. Hold a handful of maida and press it in your fist. Open your fist and check if it retains the shape then ghee is enough otherwise add a little more ghee. If you will not add the optimum amount of ghee then samosa will not become crispy. 3. Add water and knead a dough. 4. The dough is ready. Cover it with a wet cloth. Keep it aside for 15 minutes. 5. Before making samosas apply a little oil on your hands and knead it once more. 1. Take a small section of the dough. 2. Roll it a little bit thicker than a chapati. Use oil for rolling it. It's a little difficult to roll maida that too without using maida for dusting. If you are a beginner and you are finding it really difficult then you can use maida instead of oil. Make sure that you brush out the excess maida after rolling. 3. Cut it into parts. 4. Form a cone with one section. Fill the stuffing inside it. 5. Now you will have two sides. One where you have joined the straight line for the cone. Let's call it front side. And another one will be plain. So now you need to make a pleat on the back side. Apply water on both the sides and stick them together. Please check the pics below for the reference. 1. For frying samosa, we need hot oil. 2. Once the Oil is hot, slid the samosas inside it and reduce the flame to low. Don't increase the flame. This is a slow process. It will take at least 15 - 20 minutes. Make sure that there is enough oil and space in kadhai while frying samosas. If samosas will touch the base/sides of kadhai then they will not get the uniform colour. Fry until they are golden brown. 3. Once done keep it on an absorbent paper. 4. Serve it hot with red chutney and green chutney. 2. Dry roast cumin seeds and coriander seeds. 3. Cool down then put it in a mixer to make a coarse powder. 5. Add cumin seeds and coriander seeds. 6. Add dried red chilli. Don't forget to discard it before stuffing. 7. Add a coarse ginger and green chilli paste. 8. 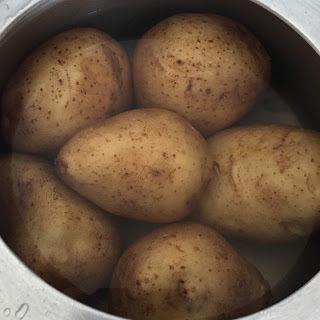 Mash boiled potatoes and add it. 9. Add salt, red chilli powder, dry mango (Aamchur) powder and cumin-coriander powder prepared in step 3. 10. Add a little water. Mix everything well. cover it and let it cook on low flame for 2-3 minutes. 11. Stuffing is ready now. Keep it aside. Now we will prepare the dough for samosa. 12. 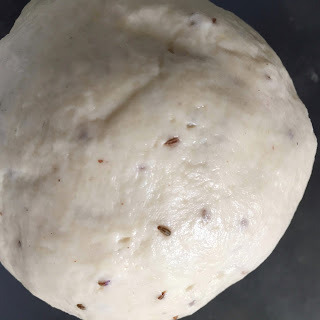 Mix all purpose flour(Maida), carom seeds(Ajwain), Salt and ghee. You can substitute ghee with refined oil. 13. Hold and press it in your fist. It should clump together. If not, then add a little more ghee/oil. 14. Use water to knead it into a dough. 15. After kneading, cover it with a wet cloth for 15 minutes. Knead it again after applying oil in your hands. The dough is ready! 16. Take a small section of the dough. Roll it a little bit thick than a chapati. Use oil for rolling it. It's a little difficult to roll maida that too without using maida for dusting. If you are a beginner and you are finding it really difficult then you can use maida instead of oil. Make sure that you brush out the excess maida after rolling. 17. Cut it into two equal parts. 18. Make a cone with one section and stuff it. Brush it with water before sealing. 19. You have two sides. One where you have joined it to make a cone like structure and another one is plain. Make a pleat on the plain side as shown in the image below. Don't forget to seal it with water. 20. Now seal both the sides together. 21. Samosa is ready for deep frying. 23. Samosa is ready to be served. Serve it with Red and green chutney. Let me know if you want the recipes of chutneys as well. I will be more than happy to share.